Gregg: I appreciate you joining us today. Andrew has a ton of expertise in the disciplines of marketing, in general, and especially online marketing, social media marketing. We’re actually going to tackle this topic in two installments. Part one here today, we’re going to cover four key points for you, how to use social media if you’re a smaller company, if you’re a larger company, and then also how to handle negative feedback. To get started, Andrew, let’s talk about something you and I definitely agree on and that’s the fact that there’s a ton of hype surrounding social media these days. How should landscape contractors look beyond this hype to figure out how to effectively use social media? Andrew: Well, great question. Social media is obviously in the news a lot. If you’re a tech geek, like I am, there are articles about it every day in Google News, CNN, Forbes, everywhere. That makes it really easy for marketing SEO companies to sell that and get clients and sell those services. Something that I come across a lot is that a lot of companies might have a social media plan, but oftentimes they’re doing it because a company sold it to them on the basis of, “You’re going to get all these new clients. You’re going to get all these new fans. You’re going to get all these new likes.” They’re approaching it from a perspective that you need to be doing it because everybody else is doing it. The approach that we take at my agency’s a little bit different because, and this might sound odd for a founder of a lawn care marketing agency to say, is I am a little bit bullish on social media. I’m not one of the companies who pushes that as the end all, be all strategy, but we approach it as we would direct mail, as we would email marketing, as we would SEO, search engine optimization. It’s just another tool that we can use from our marketing toolbox. The approach that I disagree with that a lot of other companies take is they do it because everybody else is doing it. I don’t like that because that’s not a goal. There’s no clear objective, and if you don’t really have a clear goal, or a clear objective in mind, there’s no way that you can measure success or failure because you really don’t know what you’re doing. There’s no end game and you’re going to end up wasting time and money. Whether it’s social media or direct mail, you have to have a purpose. You have to have a goal, and you have to be able to track it and determine if you’re making a return on your investment and whether or not any campaign that you’re running is effective. Like I said, social media is easy to sell, and the myth that these companies propagate is that if you just post on Facebook, if you post on Pinterest, you’re going to get all these new customers and everything’s going to be great. That’s all you need to do, and they pretty much neglect your website. That’s just really unrealistic hype. Our approach is always to focus on delivering value to our clients, so we must be able to prove that we can bring them a return on their marketing investment. If I can’t do that, I can’t really justify selling any services to my clients, if I can’t prove that I’m bringing them a return. If the goal of any marketing campaign is to have a good return on your marketing investment, you need to take a slower approach to adopting thee strategies. Something that we do is, we tried and tested marketing methods and tools, whether that’s direct mail, whether that’s search engine optimization, door hangers. If executed properly and it’s proven to work, we’ll recommend it. We’ll let the other guys waste their time and money figuring out what new technology works, what type of return on investment that they’re going to get from social, on what the best strategy is to take. Something that I’d like people to take away from this is don’t throw out what people call old school marketing approaches if they’re still working. If it still works, keep doing it. If you’re investing ‘x’ number of dollars into a direct mail campaign and you’re getting a return on that investment, then why not keep doing it? Why throw that out the window for social media or some new hypy [SP] technology that’s getting a lot of press? You need to think these things through and not just jump on the bandwagon and follow your competitors down a road that doesn’t have a clear objective. We take things slower. That said, it sounds like I’m really against social media, and I’m certainly not. If you listen to the second part of this interview, you’re going to hear me go into details on how important I think social media’s going to be in the future. Keep everything in perspective. Everything has to have a goal. You need to do any marketing plan that you have with a very specific purpose and really track your numbers. Don’t get caught up in the latest and greatest. Your return on marketing investment is going to be the ultimate judge of your success of any marketing campaign. The problem with social media is it can be tricky to track the return on investment. Some companies will tell you that, only thing that you need to be concerned with is how many likes you’re getting. They’ll tell you that it’s all about branding. It’s all about just getting your name out there. It’s about going viral and getting people to share your posts. A bit of that is true. They’ll give you some other spiel that doesn’t really have clear metrics. The way I look at it is follows, likes, fans, even the ranking of your website, how it ranks on the first page of Google, that’s just a guide. The only metric that I really care about for my clients is, “Are their sales going up or are their sales going down?” That’s the only metric that matters at the end of the day. Fans are nice. It’s great. So 2000 people like your lawn care company, that’s swell, but if nobody’s buying anything, who cares? I’ve said the same thing to you before about websites. So you have a great, beautiful, pretty website, but you’re not doing any search engine optimization, thereby nobody’s seeing it, so who cares if you have a website? You have to keep these things in mind, and you really have to track your metrics. Social media can be a big waste of time, but if you have a well thought out marketing plan, Facebook, Twitter, Pinterest, YouTube, they all have their place. The question becomes, how can you leverage social media to make money? Let’s think about that. How are people using social media? Are people really going to Facebook and searching for a lawn care company in your area to make their decision, or are they going to Google or Bing? They’re really going to Google or Bing. You might have some people that ask their friends on Facebook, “I need somebody to mow my lawn. Do you recommend anybody?” Yes, that happens. That’s going to be a very, very small number, but that happens. Most people are still using Google and Bing to find a lawn care company in their area, but they might turn to the network to ask for advice. If people aren’t predominantly searching for lawn care companies on Facebook, then who exactly is going to be viewing your Facebook page or your Twitter feed or your Google Plus company page? That’s going to be your existing client base. It’s typically not going to be people who’ve discovered you on the social network. It’s going to typically be people who have been to your website or who are existing customers and they’ve liked your Facebook page, they’ve plussed-one you on Google Plus, or they’re following you on Twitter. If your followers are your existing client base, your marketing approach needs to be better. You have a different audience than somebody who is not your client. Since it’s your existing client base, the approach you take would be much more akin to email marketing, that you’re sending emails to your existing client base, which I hope everybody’s doing on a regular basis. Since you have a different audience than somebody just stumbling across your website, or finding you in Google, your goals are going to be slightly different. For instance, your goals would be about selling more services to your existing client base, building a deeper relationship with your clients, turning them into friends that will never leave you, selling more services, encouraging your followers to refer, selling more services, getting reviews and testimonials that you can use in your marketing and on your Google local page, your Yelp page, your City Search page, and selling more services. If you hear me here, there’s a recurring theme. You’re marketing to your existing client base so your ultimate goal is all about increasing their customer lifetime value. That’s really the approach that we take when it comes to social media, email marketing. Typically, when the client comes to us and they want to do a social media campaign, we usually combine that with email marketing because when you combine the two you’re going to reach a bigger audience and you’re going to sell more services. You’re going to be able to up sell them into different services that they might not be using; you’re going to be able to get them to buy special seasonal promos that they might not be using. I say that it’s good to combine the two because if you think about how you use email, or how you use Facebook, you’re not always going to see every single message that a company sends to you. A lot of us are checking email or Facebook on our phones these days, on our iPhones, on our Android devices and we’re skimming the headlines. We’re skimming the subjects. We’re skimming through our news feed, so your followers aren’t always going to see your message. We want to touch them as frequently as possible. We want to be emailing them regularly. Once a week would be good. We want to be posting regularly to our Facebook and Twitter and our Google Plus feeds. The more times we can, I call these touches, the more times that we can touch our clients, the more times they see our message, and the more opportunities that they have to make a purchase and buy one of the services that we want them to buy. Andrew: That’s the goals that you want to have in mind. How do you track that? You’re going to be spending all this time on Facebook. You’re going to be curating photos. You’re going to be posting interesting topics. How do you track ROI on social media, your website? You can use Google Analytics to get an idea of how much traffic you’re getting and where they’re coming from. You can see if they’re coming from Facebook, if they’re coming from Twitter. Facebook has built-in analytics as well that will give you some gauge, on how effective your message is and what your reach is. Then also you can set up phone numbers ultimately to track where your leads are coming from, whether it’s from Facebook, or different places like that. Ultimately, there’s no replacement for properly training your phone staff, actually ask where the person’s coming from. How they found you and to log every call. Either in a phone log, which could be a simple piece of paper, or into a lawn care management software like Service Auto Pilot or something like that. They’ve got to ask. They’ve got to track. There’s no better replacement than talking to your customers, talking to your prospects and leads, asking them how they found you. That’s going to be the ultimate judge. The number of Facebook fans that you have, who cares? I want to know how many people are picking up the phone and calling me and buying something or emailing me and setting up weekly lawn maintenance service or purchasing some other services. You’ve got to track it and ultimately that means you have to get your phone staff involved because that’s going to be the ultimate and the best metric that you can have as far as your response. Andrew: Unfortunately, that’s an answer that a lot of people don’t want to hear. They want to think it’s going to be easy, and they don’t want to ask this question, but there’s just not a replacement for that. If you don’t ask, you’re not going to have a clear idea of how effective any marketing that you’re doing is. It’s the same for a direct mail campaign. If you’re sending out direct mail, how are you going to know what your response rate is? How are you going to know how many people saw your flyer, your post card in the mail and called unless your phone staff is asking them? You’ve got to ask. That’s ultimately what it comes down to. Analytics on Facebook or Google, those are just guides that tell you how well you’re doing as far as certain basic data. How much traffic you’re getting, all these different things, but ultimately you’ve got to ask. That would be how you want to track the ROI. Why don’t we talk about what you’d want to do if you’re a smaller company just starting out? Gregg: It’s funny because one thing I get a kick out of on Facebook especially, I’ll check out different lawn care company’s websites, and it’s always interesting. I ask myself, ” wonder how big this company is?” Because on Facebook a lot of times all the companies look the same, provided the Facebook page is built fairly decently. Let’s say you are a smaller company, maybe just a couple of crews, what’s that company strategy with social media? How much time do they spend? How do they implement it, track it, do all of the stuff that’s so important? Andrew: At our agency, we work with companies of all sizes. A million plus companies, quite a few of them, and we’ll even take on the smaller guys. We even have a couple of clients that have one crew. They’ve just started their business a couple months ago, but they’re very eager, they’re hungry. We’ll even work with those guys as well. I can tell you exactly what I recommend to those guys. If you’re a small company, I would definitely recommend setting up your social pages as soon as possible. That would include a Twitter, go ahead and set up a Twitter feed, set up Facebook for Business, not a personal page, for your business. Make sure it’s a Facebook business page. Very important. We’ve had a couple of clients come to us who have 500, 600 followers on a personal Facebook page that they have their company name on and they’re really in jeopardy. We had to switch them over to a Facebook for Business page because they’re in jeopardy of getting deleted because Facebook will delete your page if you’re running a personal page as a company. Plus if you’re running a Facebook for Business page, you get access to the Facebook analytics I was describing to you. And then, also set up a Google Plus page. Google Plus, if your listeners aren’t familiar with it, that is Google’s answer to Facebook. That’s their own new social media platform. It’s going to become more and more important. We’ll get into that in Our Future of Search interview. I go into that on depth. Set up, at least, those three. I’m a big proponent of video. If you go to my blog, you’ll see I have videos for just about everything. I’m a big fan of putting videos on our clients’ websites as well. I’d even recommend, when they’re ready, go ahead and set up a YouTube page as well and different things like that. LinkedIn isn’t going to be extremely helpful for a lawn care company. Typically, it’s more business to business people. LinkedIn, I probably wouldn’t recommend you spending time on that. If you are a landscaper, Pinterest does have some value, but again, Pinterest, that’s something that me and you could have another conversation on as well because that is one of the newest social media networks, but you really need to approach that from a very specific angle because you can waste a ton of time just on Pinterest that doesn’t bring you any new business. Gregg: That’s more of a photo sharing platform, right? Gregg: We can talk about that at another date. Andrew: We won’t go into that, but I just wanted to mention it because it is quite popular. If you’re small, just set up Twitter, Facebook for Business, Google Plus Local for business pages. Immediately add a like box, a follow button, and plus-one boxes to your website. I’d put them on every page. That way people can click the like or follow button, and with one click, they’re a subscriber to your Facebook page or your Twitter feed or your Google Plus page. You want to do that as quickly as possible so you can start collecting followers. Your customers are going to come to your site, prospects are going to come to your site, and they’re going to click that like button. They’re going to click that follow button. They’re going to get into your sales pipeline because they’re going to be following you on Facebook or Twitter, and then you can start marketing to them as you would with an email campaign. You’ve basically gotten their email address, in a sense, because they’re a subscriber of those pages. You want to do that as soon as possible. I would go ahead and start posting some relevant info maybe, once a week, but the key here is if you’re a small company and you have less than 100 followers, do not spend an inordinate amount of time on Facebook and Google Plus. Right now, your goal should just be to collect followers, collect likes, start building that list. Then after you get to 100, you might want to think about putting an investment into hiring somebody to manage your social media for you or to start spending some time doing that each week. Don’t waste a lot of time on that until you start to get quite a few more followers. Once you’re up over 100 followers, why don’t we go directly into what a larger company would do? A larger company’s already going to have 100 followers, and it starts to make more sense to put a strong social media plan in place, to put a content strategy in place and have focused goals behind each of the posts that you post. One of the things that I would recommend for a larger company is to create a social media marketing calendar. You want to plan all your posts in advance and you want to know, and they need to coincide with different promotions that you’re doing throughout the season as well. All of this should be planned in advance just like, I’ve mentioned before, your marketing. You should have an internal marketing calendar. You should know approximately what date your direct mail flyers are going out, when you’re going to do door hangers on particular neighborhoods, when you’re going to promote special services. You should have all your stuff pre-printed in advance. You’re going to do the same thing with social media. You want to plan everything in advance. There’s no flying by the seat of your pants or, “I’m just going to log into Facebook this day, and I’m going to decide off the cuff what to post.” Plan it in advance. Decide what your goals are, and plan posts that will help you accomplish those goals. Some of those posts might be, “We’re running a special promotion on a lawn treatment this week. The first ten people to share this with their friends get service for free, or get a discount.” There’s a gazillion different things that you can do, but you need to have everything planned in advance. Once you decide that you want to have a fully functioning social media strategy in place, your goal is to engage with your existing customers and your fans on a personal level. You want to interact with them. You want to communicate with them. You really want to build a friendship. Friends don’t fire friends, is what I like to say. If you’re friends with your customers, and you’re interacting with your clients, it’s less likely that they’re going to give somebody else, a competitor, opportunity to take your place. Companies, oftentimes, they don’t want to interact with their customers. They don’t want to communicate with them. They feel like if they’re communicating with them that they’re bothering them, but the great thing about social media is it is a passive medium. People might see your posts in their news feed, but they choose whether or not to interact with you. You’re not really taking any time out of their day. They decide whether or not, what level of interaction that they want to have with you. These interactions, whether it’s somebody posting a problem that they had with a service or something on your page and you interacting with them and solving their problem or any of these things can help strengthen your relationship and build customer loyalty, which is really, really important. If you’re interacting with them on a personal level and maybe, even sharing stuff about what’s going on in the community, maybe you’re sponsoring a baseball team and [inaudible 24:25] doing business, think about it from a perspective of, “What would my customers in this market respond to? What are they concerned with?” If you take that approach and think of it from their perspective, chances are you’re going to realize pretty quickly that your customers aren’t really interested in the scientific details of the seed that you’re using this season. Look at that from that perspective. 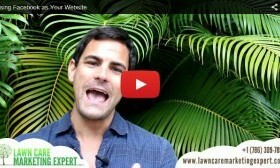 You don’t need to go into the science of lawn care. They’ve hired you to solve that problem for them. They’ve hired you to take care of their lawn, so chances are they probably don’t really care about the details of the chemicals and stuff that you’re using and different things like that. Post topics that you think they would respond to. This could be community events. This could be customer of the week. It could be photos of a great landscaping job that you just did that you’re really proud of that can help encourage other people to take a chance and use you to redo their flower beds, or to plant some new shrubs. Think about it from that perspective of what you think people who are just homeowners that see your posts, what they would respond to. Gregg: It’s going to help them make a connection with your company, in a sense. Andrew: That’s exactly right. I think about social media and what you post to your page very similar to the crew leader that you have out in somebody’s lawn and Suzy Homemaker comes out, and she’s interacting with your guys that are there on her lawn. It’s the same sort of interaction that you want. You want a crew leader that can talk to your customers, build rapport, that your customers like and like doing business with. They think they’re professional and your crew leader’s there to solve their problems. It’s the same sort of thing on social media and on Facebook as well. You want to become friends with your clients and you want to build their loyalty.